Another 49 wins & 79 nominations. This outstanding series composed by 38 episodes results to be a magnificent costumer , set in Henry VIII's (Jonathan Rhys Meyers) epoch . The first season deals about his relationship to Cardinal Wolsey (Sam Neill) and spouse Catherine of Aragon (Maria Doyle Kennedy) when was born a daughter named Mary Tudor (Sarah Bolger) . The conflict origin takes place when Catherine of Aragon was previously married to Arthur , Henry VIII's older brother . Thomas Wolsey (Sam Neill) , Archbishop of York , was the most influential member of Henry's Council . Wolsey failed to obtain the Pope's permission (Peter O'Toole) for Henry's marriage and his fall from power -facing other favorites as Charles Brandon (Henry Cavill) and Norfork (Henry Zcerny)- was swift and all his possessions including the Palace of Hampton Court were forfeited to the Crown . The second season specially concerns when Henry breaks with Catholic Church and secretly married Anne Boleyn (Natalie Dornier) and creating Anglican religion . Anulled his marriage to Catherine (1533) , on the basis that she had been previously married to his brother , Pope refused sanction Henry's marriage to Anne and excommunicated the king (1534) . Then there appears Sir Thomas Moro (Jeremy Northam) a man of the Renaissance ,lawyer , statesman , philosopher , writer (Utopia) and devote Catholic . When Henry proclaimed himself his divorce as Head of the Church , it was inevitable that the two men would clash . Those who stood in Henry's way , even those he claimed to love , invariably ended up on the scaffold , many of his underlings were led from their cells in the Tower of London and beheaded . These , at new times his favorites were Thomas Cromwell (James Frain) and Thomas Crammer (Hans Matheson) . But the marriage to Anna did not last long and she was accused of adultery with his brother and four Communers . Later Henry married Jane Seymour (Anita Briem) who died twelve days after giving birth to a son , later Edward VI . This is an exciting TV drama full of historical events , emotions , political ambitions and sexual relations . 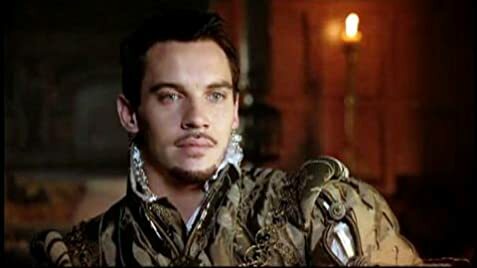 Henry VIII is well played by Jonathan Rhys Meyers who takes a contemporary approach as a young man athletic , astute , philander , handsome but also cruel . Packs excellent performances by a large cast with a magnificent plethora of secondaries . Colorful , luxurious scenarios designed by Tom Conroy , fitting rightly to Renaissance time . Evocative and imaginative musical score by Trevor Morris . Glamorous and glimmer cinematography by Ousama Rawi . Series are lavishly produced by Michael Hirst, who also produced Cate Blanchet's Elizabeth I and II . ¨The Tudors¨ is stunningly and convincingly directed by various television directors as John Amiel , Brian Kirk , Steve Shill , among others . Henry Cavill and James Frain were both in "The Count of Monte Cristo" (2002). King Henry VIII: You think you know a story, but you only know how it ends. To get to the heart of the story, you have to go back to the beginning. In the series, Thomas Wyatt has an on-again/off-again relationship with Queen Catherine's lady-in-waiting. In real life, Wyatt married Elizabeth Brooke, daughter of Thomas Brooke, 8th Baron Cobham, in 1520. However, there is historical evidence that the real Wyatt was infatuated with Anne Boleyn, as shown in the series.